We are familiar with the constellations that we see regularly in the night sky - a distinctive pattern of stars. 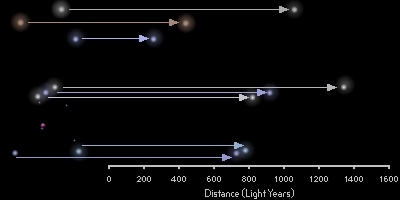 However, although these stars may form shapes that are recognisable to us here on Earth, they do not usually have any real link to each other, as they are often at different distances from the Earth, and are in fact very far away from each other. Stellar clusters, on the other hand, are systems of stars that are held together by the gravity of their members. Eventually these clusters slowly evaporate. After a few billion years, the relatively loose collections of stars known as open clusters will no longer be held together by gravity and the cluster will stop existing. More highly compacted stellar clusters, known as globular clusters, which are typically about 15 billion years old, have not yet evaporated. Due to their relatively well-known distances, and the similarities that tend to exist among their stars, stellar clusters play an important role in astrophysics. Some of the nearest stellar clusters are visible with the naked eye. The most visible open clusters are the Pleiades and Hyades, both to be found in the constellation of Taurus.